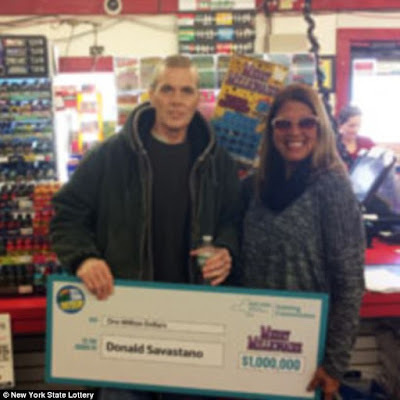 An upstate New York man who won the Merry Millionaire scratch off lottery for $1million, earlier this month, has died suddenly. Donald Savastano was recently diagnosed with stage 4 cancer and died suddenly on Friday. 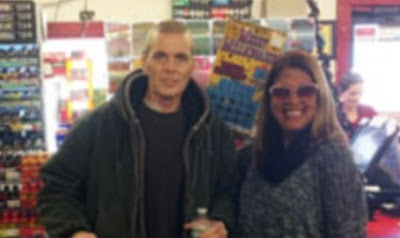 The Queens, New York, native had claimed his ticket on January 4 after buying the $10 scratch off on a whim. Savastano claimed the lump sum payment of $661,800. 'Being a self-employed carpenter, I didn't really have a plan for retirement,' the 51-year-old self-employed carpenter explained to WBNG-TV at the time. Savastano grew up on Long Island and learned the carpenter trade from his dad, according to an obituary published on Sunday by Lester R. Grummons FUneral Home in Oneonta. The man had been living in Sidney, New York, for the past 10 years with girlfriend, Julie Wheeler, and her two sons. He is survived by a mother, two sisters and four brothers. The obituary included a special thanks to Bassett Hospital and Tri-Town ER for taking care of the man in his last days. It also mentioned that he had been on jospice care for a few days, before passing.